From our Fall 2018 Newsletter–This spring, Natural Areas and Preserves Manager Becky Hill pondered how best to replace a boardwalk and wildlife viewing platform at Kehl Lake Natural Area. Fluctuating water levels have taken a toll on the old structure, designed and built by staff and a special group of volunteers in 1999. Back then, Northern Building Supply donated the lumber, which Brian Price, our founding Executive Director, ferried across the lake in an aluminum fishing boat. At first Becky looked at some quick fixes—replacing a section of boardwalk that had been submerged for the last three springs. “But we figured that this problem wasn’t going away,” says Becky. “And we want the structure to last for the next 30-plus years.” Now plans call for installing a floating platform like the one at DeYoung Natural Area along Cedar Lake. “That structure is weathering the test of time very well,” adds Becky. The care and maintenance of 26 natural areas 30 years after our founding is just one aspect of this duty and labor of love that we call “Stewardship.” In addition to building and maintaining signs and kiosks, trails and boardwalks, overlooks and stairways, it is also removing downed trees after a big storm. 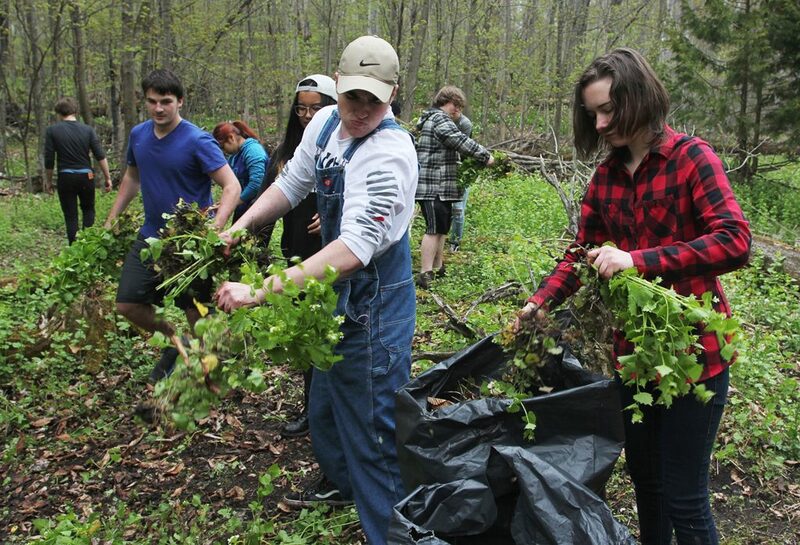 It is the annual battle of keeping invasive plant species under control. Stewardship engages the next generation by partnering with schools on workbees. And it is harnessing the wonderful energy of dozens of hard-working volunteers who spend hundreds of hours lightening our load, doing everything from spreading mulch to building boardwalks to planting native wildflowers. In addition, this department of the Conservancy is also responsible for annually monitoring all the lands—our own as well as over 200 private properties—that have been permanently preserved with donated or purchased conservation easements. Of the 13,500 acres we have protected, about 11,000 acres are privately owned. Monitoring involves maintaining strong working relationships with landowners and walking all of these properties every year. This practice ensures that the natural features of these lands are intact and that the terms of these permanent conservation agreements are upheld, even when the land transfers to a new owner. Most recently, Stewardship has also branched out into providing unique recreational opportunities to engage the next generation of Conservancy supporters who want to interact with nature in a more physically active way. 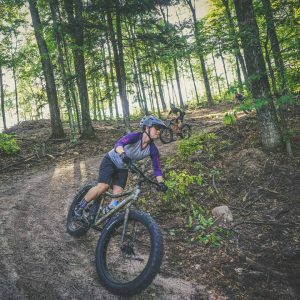 This includes grooming cross-country ski trails at the 721-acre Palmer Woods Forest Reserve, and just this fall, constructing (and maintaining) a mountain biking trail, too. The new mountain biking trail took two years of planning and called for the hiring of experts to design and construct it. And yet, it was a struggle to balance it all with limited resources. Every dollar we raised went into the ground so to speak. We didn’t hire our first Stewardship Director until 2001. “We relied a lot on volunteers,” says Bobbie. 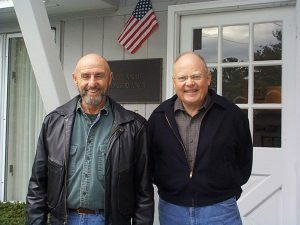 Dedicated members of the Volunteer Stewardship Network John Bull (l) and Tom Dunfee in 2001. One of them was Tom Dunfee, a retired physician who with his wife, Gretchen, had moved permanently from Indiana to Little Traverse Lake. 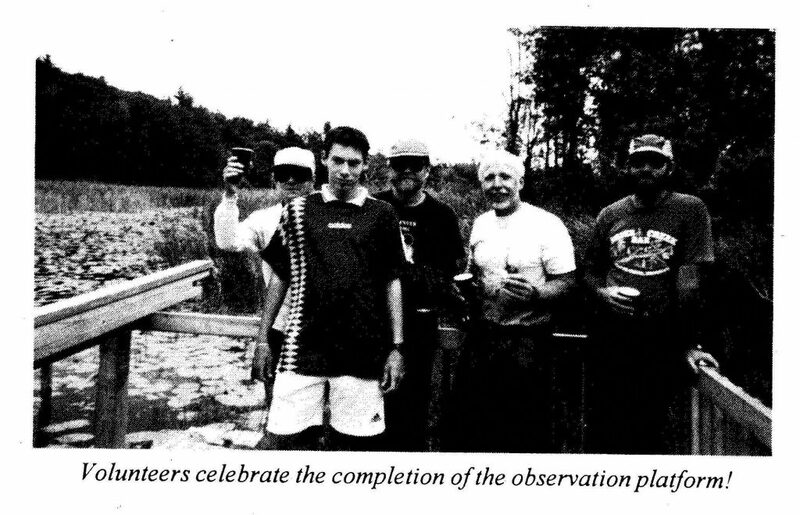 Tom, along with other dedicated volunteers like John Bull, Jim Vachow and Chuck Whetsel formed the nucleus of a group called the “Volunteer Stewardship Network,” organized in 2001 by our first Stewardship Director, Pete Nichols. The group was instrumental in creating the trail at Houdek Dunes—digging dozens of postholes, trimming branches, painting markings on the trees to guide hikers. “We had a grand time,” recalls Tom. They would often meet for breakfast and get their marching orders from Brian and Pete. “There was good old-fashioned camaraderie and we worked in all seasons, half days, full days,” says Tom. 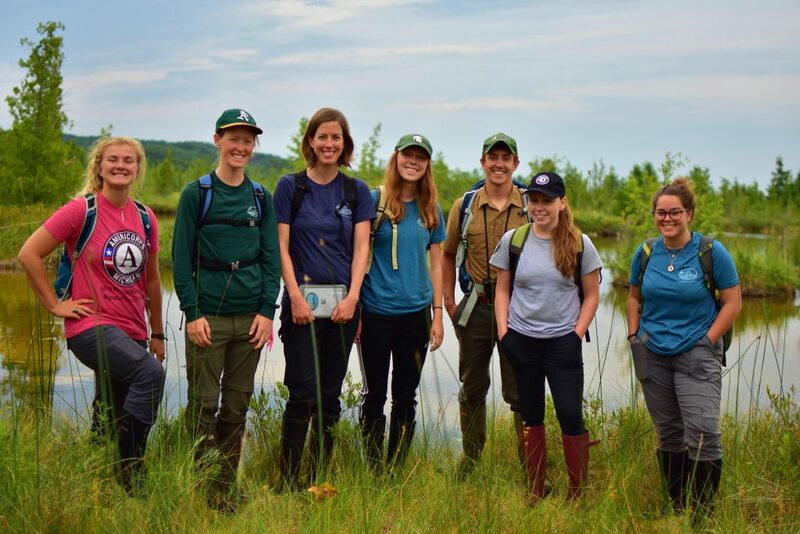 The Network grew as they recruited and supervised other volunteers who helped to blaze trails at Teichner Preserve, Lighthouse West and Chippewa Run. 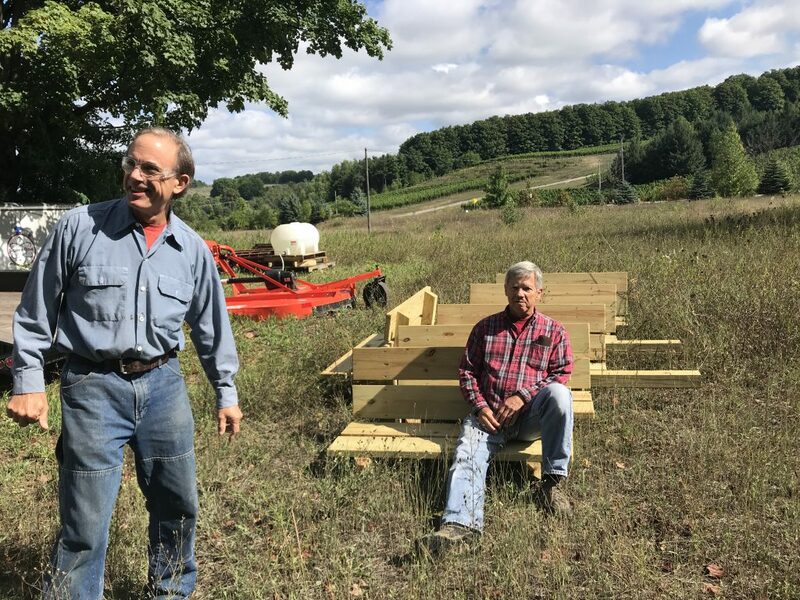 Carpenters extraordinaire volunteers Dave Coyne (l) and Al Swiderski (sitting) with six benches they built for our natural areas. Luckily, a special group of more than 20 volunteers called trail stewards help care for our many natural areas. 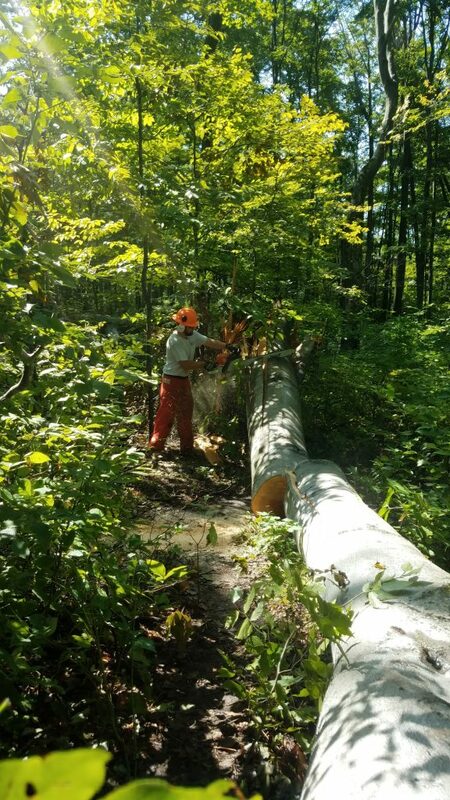 They walk the trails at their designated natural area at least 6 times a year, and many every week, to check for downed trees blocking trails, pick up trash, clear back encroaching brush and watch for any other safety or environmental concerns. 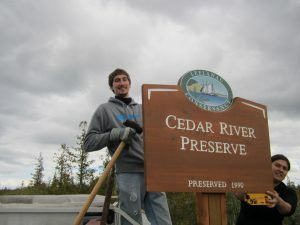 The growing responsibilities of caring for protected lands has also required expanding our staff from one to four full-time positions over the last two decades, and this year we were also fortunate to have three AmeriCorps staff members join our ranks for 6-9 months of great stewardship opportunities. Great job. Makes me proud to be a part of this great organization. thanks, Rich! We are so fortunate to have you serving on our board and guiding our work in Stewardship. Great write up on my Dad, Tom Dunfee!!! Makes me so proud of his love for The Conservancy!